Creating your mascot’s back story is an important and often over looked part of defining the personality of the character. A good back story helps establish the character, explain who he/she is, and provide motivation for the performer to develop a unique persona. The personality of the mascot helps dictate his actions and habits. 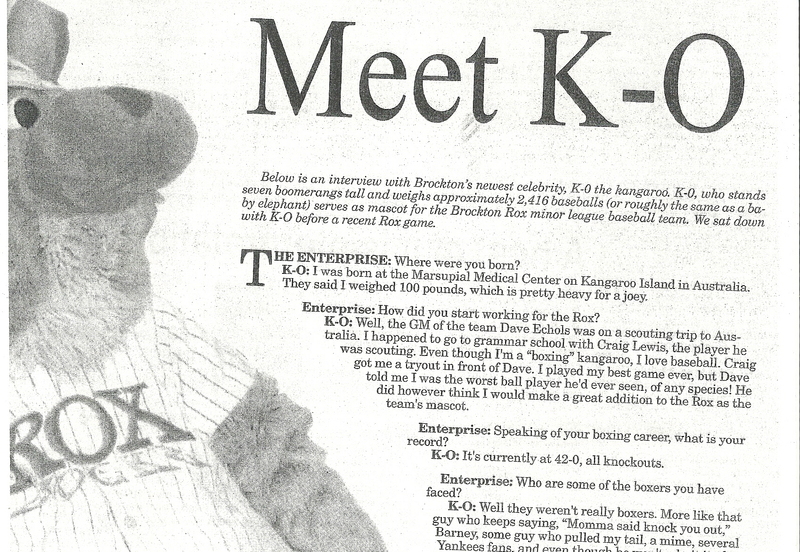 One of my favorite character biographies was for K-O of the Brockton Rox baseball team in 2003. It was done as an interview with the local newspaper and allowed me to present the mascot’s story to the public in a humorous fashion. As a performer I always “pushed it” and this mock interview does as well, with a few jokes that probably should have been edited out. The Enterprise: Where were you born? K-O: I was born at the Marsupial Medical Center on Kangaroo Island in Australia. They say I weighed 100 pounds, which is pretty heavy for a joey. Enterprise: How did you start working for the Rox? K-O: Well, the GM of the team Dave Echols was on a scouting trip to Australia. I happened to go to grammar school with Craig Lewis, the player he was scouting. Even though I’m a “boxing” kangaroo, I love baseball. Craigh got me a tryout in front of Dave. I played my best game ever, but Dave told me I was the worst ball player he’d ever seen, of any species! He did however think I would make a great addition to the Rox as the team’s mascot. Enterprise: Speaking of your boxing career, what is your record? K-O: It’s currently 42-0, all knockouts. Enterprise: Who are some of the boxers you have faced? K-O: Well they weren’t really boxers. More like that guy who keeps saying, “Momma said knock you out,” Barney, some guy who pulled my tail, a mime, several Yankees fans, and even though he won’t admit it, the Famous Chicken. Enterprise: Do you have to be in shape to be a mascot? K-O: Oh, I’m in great shape! That is, if you consider “pear” a shape. Enterprise: What is your family like? K-O: Well there’s my mom and pop, and my older brother Syd. We’re all in the entertainment industry. Pop was the spokes ‘roo for “Kangaroo Krunchies” a very popular sugar-coated chocolate cereal in Australia; Mom has been the featured attraction at the Kangaroo Zoo for over 10 years; Syd took the stage name “Jack,” moved to LA, and became a movie star. Enterprise: What did you want to be when you grew up? K-O: A firefighting-astronaut-cowboy who plays shortstop for the Boston Red Sox. Enterprise: What do you do for fun? K-O: I’m actually an avid belly dancer. I spend several nights each week at “Madame Bonapart’s Belly Dance Academy for Bulbous Marsupials” on fifth street. I also enjoy base jumping, extreme water ballet, poodle shaving, frisbee golf, full contact shuffle-board, making brownies, extreme bingo, underwater basket weaving, saying “wicked” a lot, extreme cribbage, parking my car at Harvard yard, and chasing my tail. Enterprise: If you weren’t a mascot, what job would you have? K-O: A male model for “plus size” clothing. Enterprise: How do you prepare for a game? K-O: I start off by eating 25 hot dogs followed by five trays of nachos with cheese, two orders of chicken fingers, a bowl of clam chowder, two bowls of chili, two double cheeseburgers, a partridge, and a pear tree. I then listen to some music to get me pumped up. Right now my pump up music is “Dare To Be Stupid” by Weird Al and “Taco Flavored Kisses” by J-Lo. I then make sure the visiting team’s cooler is emptied of regular Powerade and replaced with fish-flavored Powerade. I take the visiting teams’ boxer shorts and fly them on the flagpole as well. Enterprise: Do you have any game day superstitions? K-O: I feel it’s unlucky to take a bath during a home stand. If I take a bath, I know the team is doomed. Some people have started to notice the odor of my dedication. I’m not stinky, I’m lucky. Enterprise: What is your favorite part of the game? K-O: Hugs! I am the all time leader in hugs received per game with an average of 3,420 hugs. I am also the world leader in the dispersal of kangaroo kisses with a minimum of 2,101 fans receiving smooches at each game. I also enjoy all of the free snacks I find stuck in my fur after a game. There’s nothing like furball covered Cracker Jacks, believe me. Enterprise: What is your least favorite part of the game? K-O: TAIL-PULLERS!!!! It hurts, its mean, and if you pull my tail don’t be surprised if you get a bucket of popcorn dumped on your head. Enterprise: What is something that not everyone knows about you? K-O: That I am the uncontested, self proclaimed, “Best Mascot in New England.” I held the “Best Mascot” title in my native country and no one has challenged my title since I got here so I can only assume it’s mine. If any other mascots want to take my title and the “Best Mascot” championship beltthey’re invited to take part in my “New England Mascot Challenge!” They’ll be allowed to come perform at a Rox game, and if they can win my crowd over, they’ll be invited to the final showdown! Subject in school: Tie between lunch and recess. This helped inspire his character and attitude. He’s fat, but he feels he’s good looking so he might have to sit down after running up a flight of stairs, but that lady he just sat next to “How you doing?” He loves to belly dance so he dressed up as a belly dancer and tried to “seduce” the visiting team. He might “talk” smack to the other team, only to run away when someone makes a move towards him. The secret to being a great mascot performer is to develop a character and portray that character the entire time you’re in costume. Are you upset? Be upset in character? Tired? In character. Bored? In character. “In early 1998, Rays scouts on a fishing trip in the Gulf of Mexico spotted a strange looking animal. The creature, apparently drawn to the boat by the smell of hotdogs on the hibachi, climbed aboard and soon won the scouts over with his silly antics. During the excitement, a scout had a brilliant idea: make this fun loving fuzz ball the mascot for the new baseball team. 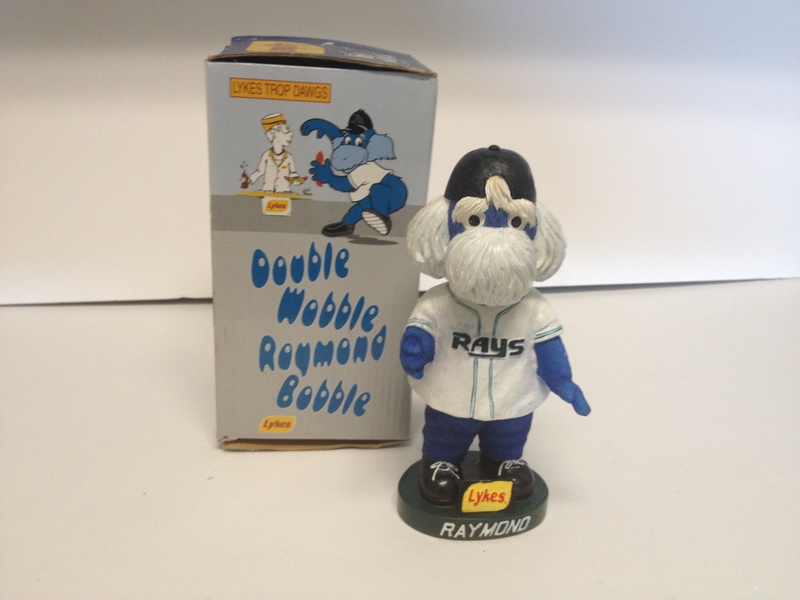 “Raymond” as the scouts dubbed him, immediately accepted their contract offer of all the hotdogs he could eat, all the high fives he could handle, and the ability to shake his groove thing to countless Tampa Bay fans. Raymond’s animal-like appearance causes confusion among fans of all ages. His fuzzy face is similar to a walrus and his bulbous blue belly likens him to a mutant manatee. So what exactly is he? The #1 issue I wanted to address was exactly what Raymond was. I decided on a “Seadog” primarily because the animal he was most often called was a dog and secondarily because seadog is a term for a pirate, and pirates are a large part of Tampa Bay’s history. TV Show: I’d rather be reading! Likes: Rays baseball, belly dancing, hugs, hot dogs, doing flips, full contact shuffle board, poodle shaving, extreme chess, reading, and KIDS! Dislikes: Hairballs, taking baths, getting nacho cheese in his fur, falling off walls. When the Astros reintroduced Orbit after a decade they made sure to craft a back story and bio to explain his absence and return. You can read it on their website. Anyone familiar with Orbit knows he’s a character and has a set personality. Establishing his bio was just step one of creating a well defined character. So remember fellow furballs, if you want to be more than a kid in a fuzzy suit, consider yourself an actor. Create your character and be that character. A well crafted back story will help you find inspiration and definition. Posted on December 11, 2014, in amazing mascots, baseball mascots, bulldog mascot costume, costume ideas, costumed characters Chicago, custom costume, custom mascot costumes, eagle mascot costume, high school mascots, houston mascots, how to be a baseball mascot, how to be a mascot, how to clean mascot costume, how to find a mascot performer, how to perform as a mascot, how to wear mascot costume, lion mascot costume, mascot advice, mascot costumes, mascot costumes Chicago, mascot design, mascot performers, mascots, MLB mascots, professional mascot, school mascot, tiger mascot costume, university mascots, wearing a mascot costume, what is a mascot and tagged amazing mascots, bulldog mascot costume, custom mascot costumes, eagle mascot costume, generate revenue, how to be a mascot, how to clean mascot costume, mascot costumes, mascot costumes Chicago, professional mascots. Bookmark the permalink. Leave a comment.